Home / Uncategorized / Happy National Biscuit Day! It’s the 29th May which means two things. Firstly, it’s our new intern, Gina’s birthday. Secondly, and much more importantly, it’s national biscuit day, which is a pretty big deal as far as these national days go. Inevitably, Gina will be expecting some kind of gift from her esteemed colleagues, allowing us to bring vast quantities of biccies in to the office under the guise of celebratory niceties – result! If you’re up for joining in the biscuity festivities, we’ve left a few of our fave recipes below. Enjoy! Is it a cake or is it a biscuit? Who cares when they taste this bloomin’ marvellous! 2. In a large bowl, mix together the flour, ground almonds, baking powder and salt. 3. Pour in the coconut oil, maple and milk. Mix to combine. 4. Lightly oil a muffin tray and transfer about 1.5-2 tbsp of the batter into each of the muffin tray cups. 5. Bake for 10 minutes. Leave to cool completely. 1. Add all the jelly ingredients into a small saucepan and cook on a medium/high heat mixing continuously until it starts to boil. 2. Take off the heat, pour into a wide bowl and leave to cool. 3. Once the jelly has cooled down, transfer into the fridge to speed up the setting process. 1. Cut out rings from the jelly, smaller than the width of the base. 2. Top each base with a jelly ring (or a small tsp of marmalade if you don’t want to make the jelly), then drizzle some melted chocolate on top. I find if u leave the chocolate to cool once melted it’s a lot easier to control drizzling the chocolate on top. 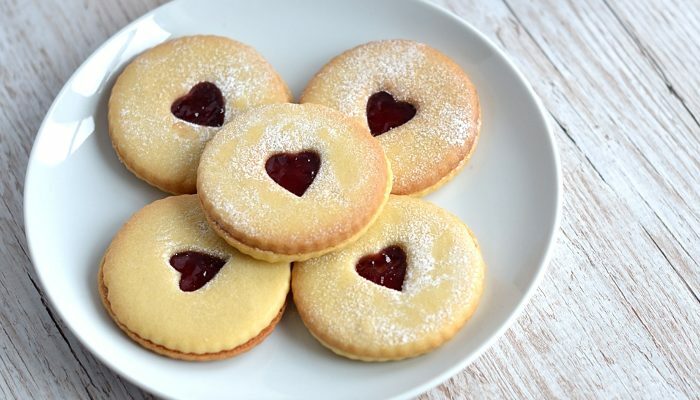 This great recipe for these jammy treats was crafted by our pals over at The Coeliac Sanctuary. Well worth a go! 1. Mix together flour, bicarb and salt. In another bowl cream, spread, sugar, maple syrup and vanilla extract. 2. Mix the flour mix into the butter mix. Once semi combined, mix together with your hands until you get a rollable dough, if the mix is too crumbly add the milk, otherwise it can be left out. 3. Roll out the dough, cut out 3 inch rounds (28 of them) and use a small icing cutter or knife to cut rounds out of the middle of half the rounds (these will become the tops). 4. Bake for 10-12 mins on gas mark 4 until cooked but not brown, allow to cool and put jam on the bottoms, top with one of the biscuit tops and sprinkle over icing sugar. 2. In a large bowl measure out your dry ingredients (gluten free flour, xanthan gum and sugar), mix. 3. Cube your dairy free hard margarine and rub it into your dry ingredients until it resembles breadcrumbs. 4. Stir in your egg and vanilla extract. Keep stiring till it it starts to come together into more of a dough. 5. Use your hands to bring it into a ball of dough. If it’s sticky, just add a little extra gluten free flour until it’s a nice, firm dough. Wrap it in clingfilm and leave to chill in the fridge for at least 30 minutes. 6. Remove your dough from the fridge and roll it out on a well floured surface with a well floured rolling pin too. I roll mine out to about the thickness of a pound coin, a little thicker or thinner won’t matter though either. 9. Transfer to a cooling rack to cool completely. 10. To make the icing, sieve your icing sugar into a bowl and a little boiling water, 1 tsp at a time. Mixing either by hand or with a mixer until it’s a smooth and thick enough but still drizzles off the spoon. You don’t want it to be runny! 11. Once you are happy with the consistency of your icing, divide it into 3 separate bowls and use your food colouring gel to colour each (yellow, pink and purple). 12. Dip your biscuits face down into your yellow, pink or purple icing so they are fully covered on top. Let any excess drizzle off. Leave it to set slightly for 2-3 minutes. 14. Using a cocktail stick, feather the icing. 15. Put to one side on a cooling rack so the icing can fully set. Excess icing should be able to drip off.